Welcome to Tablescape Thursday, sweet friends!!! I hope that you are having a wonderful week! Today, we are going to escape to a quite little shaded corner of my yard to enjoy a leisurely lunch. The birds are singing, and there is a slight breeze in the air. A lace tablecloth creates a soft and pretty underpinning for the table. I have been so anxious to set a table with my recent estate sale find! I purchased 16 pieces of this pretty china for only $6. It is very dainty and has the prettiest little pink flowers on it. It is marked H and Co. Selb Bavaria. American Fostoria glassware complete the vintage look, and pink napkins tie back beautifully to the antique vase and china. I purchased a variety of flowers from my local grocery store and created an arrangement in a vintage pink McCoy vase. Delicious macarons are ready for dessert, and there is plenty of sweet tea. Thank you dear friends for your visits and kind comments! I hope that you have a beautiful day and a wonderful weekend! Thank you, Donna! Enjoy your week!!! Such a pretty floral arrangement you created..That vase is awesome and what lace can do to create a beautiful table. Thank you so much, Jane, for the sweet comment! I am so happy that you stopped by for a visit! I hope you have a wonderful week!!! Shannon, what a beautiful setting that you have created. The sweet china is quite a find and I love the pink McCoy vase. The lace tablecloth is full of charm and creates the perfect underpinning. Please pass me a macaron or two! Have a wonderful day sweet friend! Thank you, Pam! I hope you have a wonderful week!!! Shannon, you have created such a beautiful table in a gorgeous setting. Your lovely china was quite the find. Bavarian china is always beautiful and I seldom see it anymore. Your floral arrangement is so pretty and the McCoy vase is also quite special. I certainly would enjoy being a guest at your table. Have a great day and weekend, my friend! Thank you, Sandra! You are welcome at my table anytime!!! What a lovely setting. That lace tablecloth is beautiful and I love your vintage pink McCoy vase. Such a beautiful find, unusual large cups in old china. Love the Fostoria as I have lots of it that belonged to my grandmother. Love you beautiful creations, Shannon. Brenda you are so sweet! Thank you so much for the very kind comment! Enjoy your week!!! Lovely setting and beautiful photos! So pretty, Shannon! The china was a great find. It looks beautiful on the lace tablecloth and sweet table and chairs. I have a penchant for McCoy and yours is lovely. Such a pleasant spot in your garden to set a table for two. Thank you, sweet friend! That vase was my first McCoy purchase. I purchased it at an auction over 20 years ago when I was first married. I was drawn to it’s pink color. Enjoy your week!!! How beautiful! I have my eye on those macarons! Yum! Thank you, Angelina! It is so hard not to eat all of the macarons in one sitting! My heart is singing happy songs! First everything is gorgeous and that McCoy Vase is a beauty! I collect green McCoy and have a similar one in green. But now I must chat with you about your China! What a find! Absolutely beautiful my friend. I loved having a macaron with you! Nancy, I am so happy that you stopped by for a visit! Thank you for your sweet words. Your green McCoy collection must be stunning! Oh Shannon this is so sweet. I love the delicate pink flowers and McCoy vase. Your arrangement turned out gorgeous. That lace table topper really created a romantic look- just beautiful! Thank you, sweet friend! Enjoy your week!!! Oh Shannon, this table is just dreamy! You have me wanting to pull out all of the pink dishes I have and setting a table straight away. That vase! Just stunning! Thank you, Chloe, for the very sweet words! 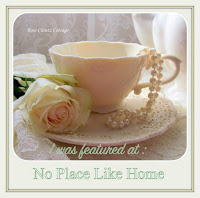 I am so excited about the blog hop this week! I can’t wait to see all of the pretty tables!! !